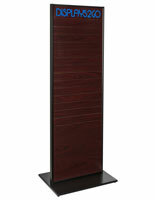 If your are debating which type of wood-finish to purchase for your place of business, you have a handful of choices. One in particular, Mahogany slatwall, offers the darkest, richest color and looks fabulous paired with black aluminum edging. 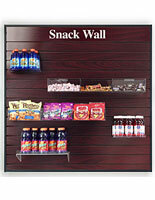 We stock panels for wall mount applications, as well as stand-alone fixtures for floor placement. Widely recognized as the most user-friendly type of merchandising displays, slatwall fixtures market your products or services via a wide variety of hanging and display accessories. Wall mount mahogany slatwall is sold in two sizes and is designed to hang more or less on their own for smaller applications. Each panel is framed in extruded aluminum with black anodized finish, which offers a cleaner presentation by hiding the open channels on either side. A custom text header is also included with purchase for labeling or personalization. 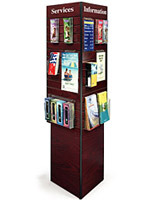 Slatwall kiosks, in two or three-sided versions, let you place the floor stands virtually anywhere for the highest visibility in high-traffic areas. The kiosks also come with custon text headers on select models. 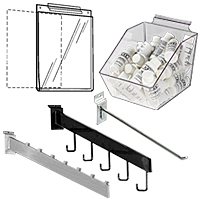 Don't forget to accessorize your slat wall display with sign holders, hanging hooks, shelving, and bulk bins that help you to merchandise products or offer takeaway literature.